All versions of the Windows OS before Windows 10 give users the option to pin something to the Start Menu or to unpin it from there by right-clicking on the given folder/.exe file/ shortcut and choosing the corresponding entry from the displayed context menu. 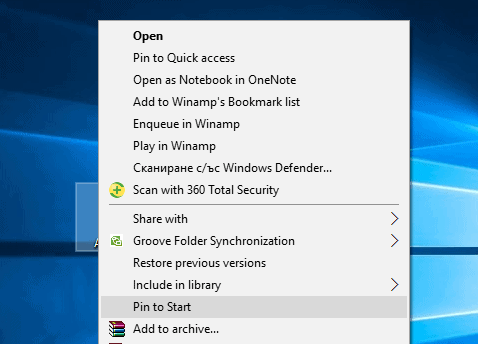 If the user wants to pin the chosen item to the Start Menu, the option to be chosen is “Pin to Start Menu”. If the user needs to unpin something from there, the required choice is “Unpin from Start Menu”. Despite that, this is not the case for Windows 10 users. In fact, they have been deprived of the aforementioned context menu entries. As a result, the users who share this type of issue are unable to pin anything to their Start Menu or to unpin an already pinned item. Normally, such a problem can be the result of some Registry and Group Policy-based settings called NoChangeStartMenu and LockedStartLayout. It is possible that some system administrator deploys those settings as a part of a Group Policy (in case your computer is in a group with a domain). Another possibility is that a 3rd party program might use such settings via your computer’s registry. 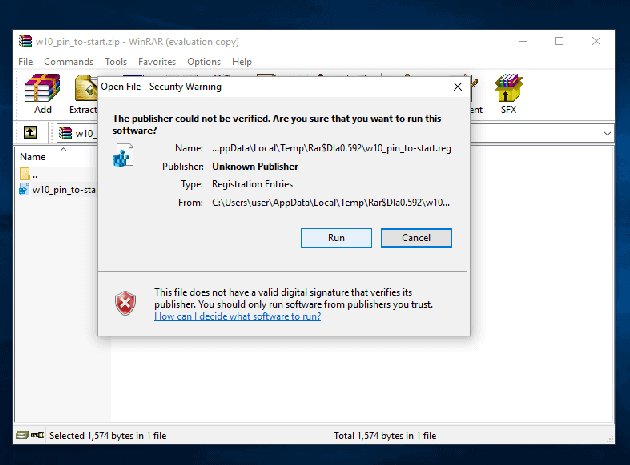 Another probable cause of such an issue is the lack of a handler for the “Pin to Start Menu” and “Unpin from Start Menu” context menu options in the user’s computer registry. The reasons for this missing handler may be various things. Fortunately, there is a solution to the aforementioned issue with the missing context menu entries “Pin to Start Menu” and “Unpin from Start Menu”, no matter what causes it. If you have been affected by this problem, you are supposed to download and use one certain .REG file. Luckily, this .REG file successfully manages to resolve such issues and deals with the Group-Policy-based and registry based settings, which can be the reason for the problem. Also, it has been created to even substitute the missing handler for the context menu “Pin to Start Menu” and “Unpin from Start Menu” entries. Download the necessary .REG file from HERE. The .REG file will be downloaded in the form of a .ZIP file. Use a program to unzip it, for example – WinRAR. Once you open the archived .ZIP file, you will find only the .REG file You should double-click on the latter – usually it goes with under name w10_pin_to-start. Confirm your action by clicking on “YES”. Lastly, you need to Restart your system. Then, once it is ON again, you can check and you will find out that the context menu options “Pin to Start Menu” and “Unpin from Start Menu” have hopefully been recovered if you have closely followed the restoration steps.